We offer free airport transfers! Our shuttle leaves from the hotel to the airport every hour 24 hours a day, seven days a week. Pick up from the airport can be arranged by calling our airport representative on 0813 1736 9844 or call the driver directly on 0813 1736 9845. See our News section for more information. 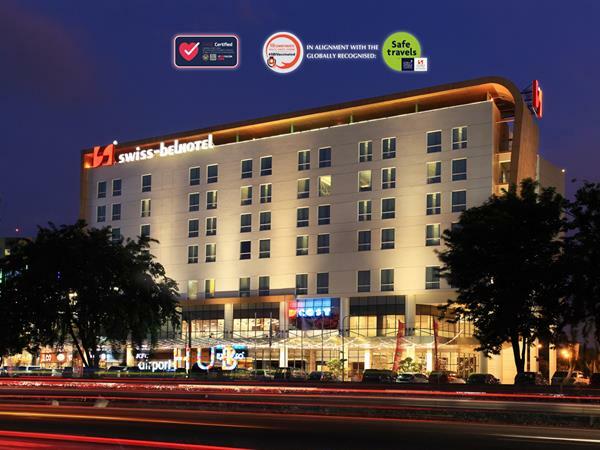 Swiss-Belhotel Airport offers convenience facilities include selection of food and beverage also entertainment options. 179 well-appointed guest rooms & friendly services with free WIFI and flat screen TV each room. Swiss-Café Restaurant offers delightful international and local dishes for a breakfast buffet or á la carte menu throughout the day while the Lounge and Bar on the ground floor serves a variety of light snacks and beverages throughout the day. Enjoy a refreshing dip in our swimming pool. Pamper yourself with ourselection of spa treatments, the perfect way to rejuvenate your body and mind.